I want to thank everyone who participated with ideas for blog topics for 2019. I loved so many of your ideas and plan to implement them starting…Now! Since this week is still a little laid back as we transition into a new year and since most of us are experiencing colder temps, let’s begin with wraps and three ways I style them. 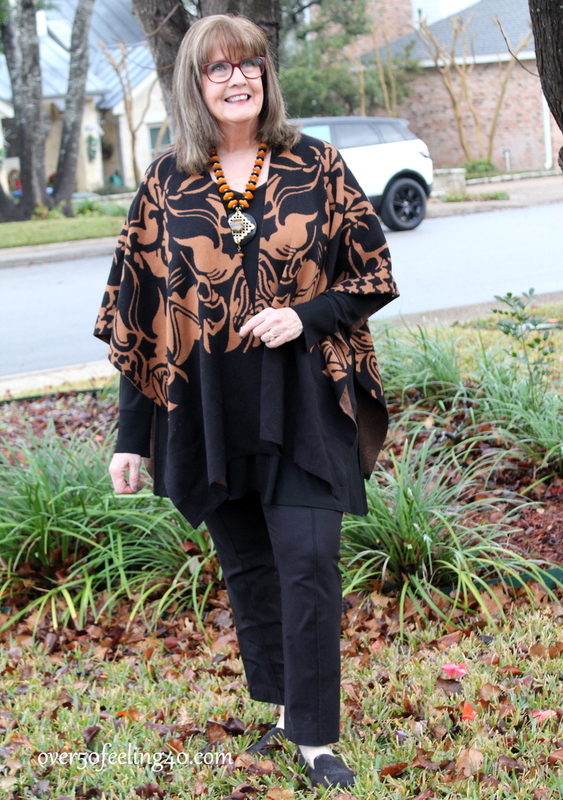 Typically, I wear a ruana or poncho style wrap. In Texas, we will also see serapes, which are longer versions of the poncho, sleeveless with only an opening for your head. 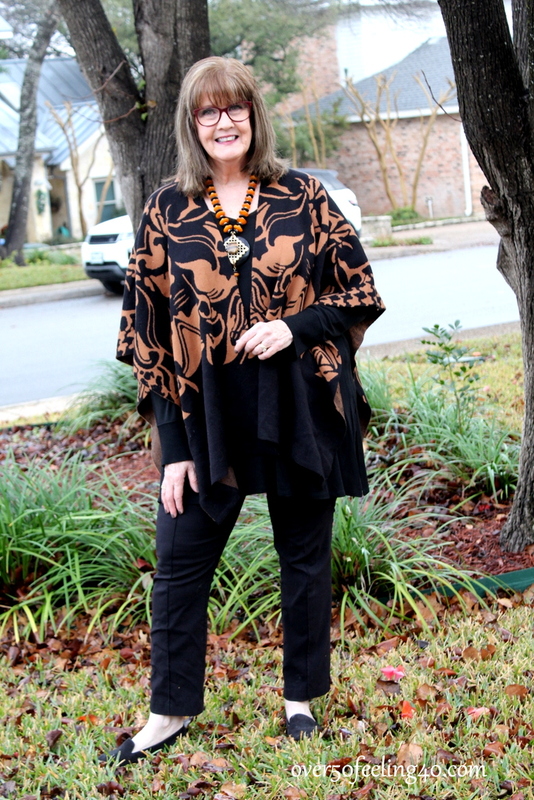 A ruana is like a poncho but the seams on the sides are open. This garment originated in the Andes region of Colombia and the ones we wear most often in the United States do not include a hood. I love to wear a ruana to add a bit of panache to any look…the ones I own display fun prints and are more open than a scarf around the neck. The only times I am frustrated with runanas are in windy weather. If the high breezes are blowing, you may be fighting the garment to keep it on or from soaring off your body like a kite into the sky. When windy days are forecast here, I select an outfit I will not be struggling with throughout the day. Today, I am wearing a winter ruana which was a fundraiser collaboration from Ming Wang and Dillards last year (The one for this year is in the slideshow below). I love the print and the ease of this look. I have paired it with.a pair of black pants I got at a boutique years ago, and a black Eileen Fisher silk tunic top. Also, on my feet are my Aerosole suede flats, and the statement necklace is a previous Chicos purchase. All items I have had in my wardrobe for a long time. I tried to find some similar items in the slideshow below. This is how I might dress to run errands or meet a friend for lunch. It is for casual wear, not for work. Ruanas are also great garments for spring time if you are retired with a more relaxed lifestyle. Just throw one over a foundation of similar color…black top with black bottoms, or blue top with dark denim…this is known as column dressing. 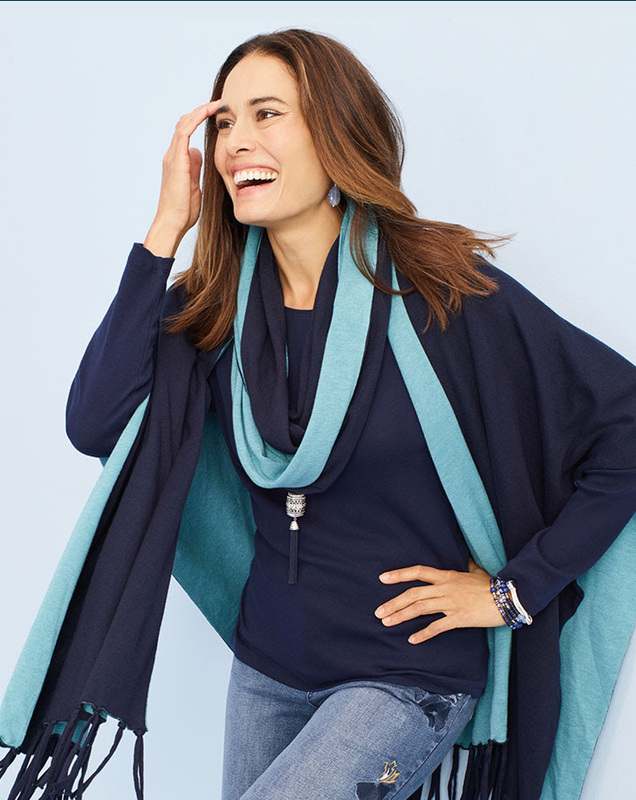 It is an easy, very flattering style of dressing and the column helps a bit with an oversized wrap. The greatest pitfall to wearing wraps are they typically fit oversized. Yet, they transition a wardrobe so effortlessly from winter to spring with lighter options available. I found this image below from Chicos, and love the way it is styled. It looks great with the jewelry and even embellishment on the jeans, so remember to have fun with a ruana as an accessory. I will return tomorrow with another look featuring a wrap. Until then, what do you think of the ruana? Are you a fan, or not? Please explain your answers and I want to tell those who are always so willing to participate just how much I appreciate you! BEAUTIFUL PIECES IN THE SLIDE SHOW….ALL ON SALE! Good morning Pam. I am on the fence about wearing a ruana. I love the look on others but not on myself. As a curvy girl plus with ample bust, I feel they add more bulk. So for me they are a no. I love the look on taller women, but I’m only 5 ft4(and shrinking..)! I love the look you put together here, and the photo from a Chicos spread. But… I would really need to try one on, naturally, and hope I Am not overwhelmed by the fabric. In a cold climate as we have here in the Northeast, it might be a nice fall, early spring addition! Thank you! As a larger woman, I am sensitive to over fitting or flowing clothes, as it was for years a stereotype. I tend to look better in something more fitted anyway. Long ago, on Designing Women, Delta Burke was one of the first larger women who got high marks for fashion. In an interview, she encouraged women to wear a blazer or some other structured top layer. That advice has stuck with me, though I’ve gotten more flowing and cardigan-happy since our society has gotten more relaxed about fashion. I like seeing ruanas on others, particularly if the top and pants are relatively fitted underneath, but I don’t feel it’s a good look for me. I do think they can be playful, and are a good alternative on many festive occasions where it’s not clear what to wear. They are also good for travel. Linda, I completely agree and that is why I only wear wraps like this for comfy times outside of work, or important meetings. Typically you find me in those fitted jackets. The styles this week were requested from some who want to be comfy at this time of year. My fitted garments will return next week. I am up front that these looks are not not figure flattering. I’m with the previous posters about adding bulk. If I wear a look like that, it’s a poncho in a thin fabric like cashmere, which drapes without adding to the silhouette . I love the ones from Halogen and have black and red. I like the way ruanas look in photos, but they’re definitely not for me. They never stay put for me, so I’d be fussing with it all day. It would be caught in the wheels of my Costco cart, and slammed in my car door when I’m running errands. I’ll take a cardigan or soft jacket any day! I just bought one at a Boxing Week sale, so I’ll be experimenting with it and deciding if it’s a look I like. Since I only paid $9 for it, I figure it will be well worth that even if I only end up using it as a cozy wrap on cool evenings at home. I gave away two beautiful winter weight ruanas because I never wore them and I regret it now that they are so popular. I do have 2 very lightweight ones from Chicos that are semi sheer that I wear over tanks in the spring and summer. The heavy ones don’t feel right to me. 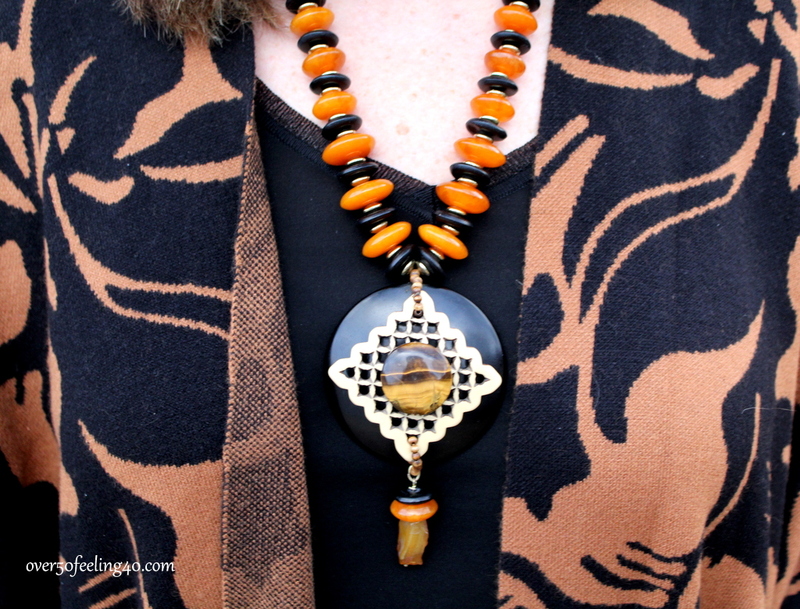 I love how you wore a chunky necklace with yours…it really balanced out the look. I really LIKE a ruana if it’s not made with too much fabric and drapes softly. That said it needs to be made with thinner fabric and isn’t really appropriate in cold weather. Thanks for the post, Pam! I like both ruanas and ponchos and wear both. Where I live they are most appropriate in fall and spring since winters are so cold. However, I would wear one if I was just dashing from the car into a coffee shop or restaurant. Yours is beautiful and perfect for this time of year. The darker colors with that necklace says dressy-casual to me! I do like them with slimmer bottoms like you show here. Column dressing is something I do often. Very flattering, and you can have some fun with pattern when wearing a column of color underneath! I’m a fan! They’re a fun alternative to a poncho and wrap. I like ruanas. I have a reversible one in black & gray. For my casual lifestyle, they add a bit of style to an otherwise simple outfit. I came to love these a year or so ago. They are perfect for transitioning in Ohio where Spring and Fall have a tough time making up their minds. I’m trying to figure out how the blue one is styled. I’ll look on Chico’s website but if you have figured it out, please explain. I’m a huge scarf person and am always trying to decipher the styles when I see one I like. I’m a fan! Lots of colour and patterns to provide interest as well as adding warmth in cold weather. Wow, your total head toe look is stunning!! Love the ruana and necklace which compliments the look. I like ruanas but don’t wear them as they are overwhelming for my 5’4″ frame. However, I am a fan of ponchos for spring and summer in a soft, thin fabric. I too agree that they are only flattering on tall thin women wearing fitted pants or leggings. So many of these type wraps make legs look short unless you are tall, thin and wearing heels. For the rest of us women, I think we look so much better in a more fitted style. Particularly somewhat fitted blazers and/or jackets that are shorter – makes one look thinner and more chic. I will admit what you are wearing in the top picture is quite attractive. This one is not as long as some others and the column dressing is good.